This research site monitors the electrical consumption as well as the interior space conditions of a production built, net zero energy home. 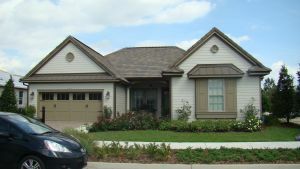 Located in Windermere, Florida, it is a single story three bedroom + flex room, two bath home with 2667 sq. ft. of living space and a HERS rating of 0. Energy consumption is offset by a 8.6 kW, split photovoltaic system (5.7kW south / 2.9kW east). It has double pane, low e vinyl windows, R-11 foam injected CMU and rigid foam wall insulation, and R-21 roof deck insulation over an unvented attic. Heating and cooling is provided by a 2 ton, SEER 19 heat pump. An energy recovery ventilator and supplementary whole house dehumidification is also provided. Platinum LEED certified, the house has all Energy Star appliances, CFL & LED lighting, water saving plumbing fixtures, and a 54 sq. ft/80 gallon active solar hot water system with on-demand hot water recirculation. It was built by KB Homes. Data collection began in April 2011. Home occupancy began in late May 2011.